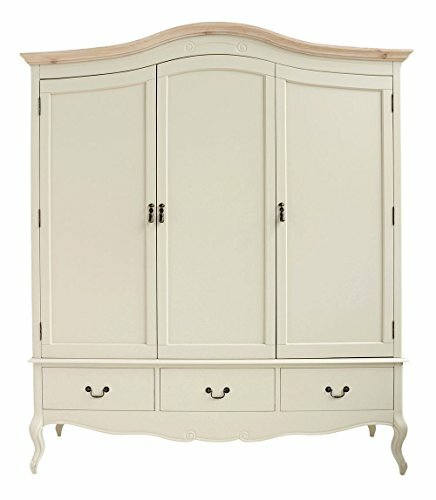 The Juliette Shabby Chic Champagne Triple Wardrobe produced within the vintage French taste. Very beautiful, undying furnishings that allows you to glance implausible in any bedroom. This gorgeous huge triple Cloth wardrobe has were given 3 deep drawers on the backside and providing various cupboard space. 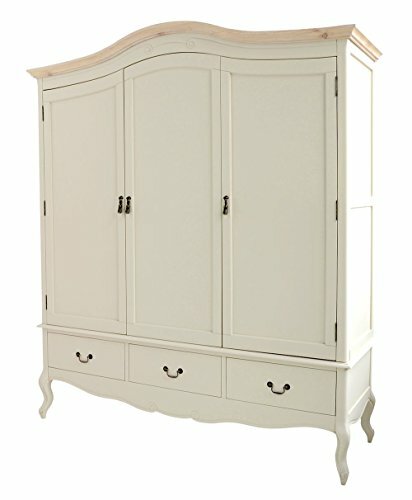 The Juliette shabby chic champagne triple wardrobe is the perfect addition to any bedroom. 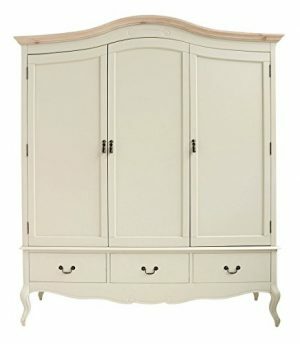 Both beautiful and practical, this stunning wardrobe has been designed to mirror the ever-popular antique French style. Matching exquisite looks with practicality isn’t always easy but the Juliette shabby chic champagne wardrobe has both a detailed design and a good mix of hanging space, shelves, and drawers. 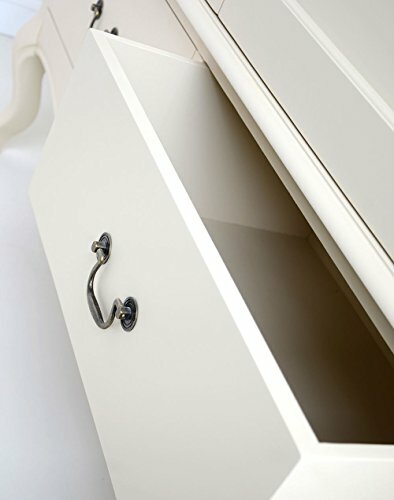 The variety of storage sections present within the Juliette Shabby Chic wardrobe provide an impressive amount of storage space, making this the perfect wardrobe for anyone with a particularly large fashion collection. 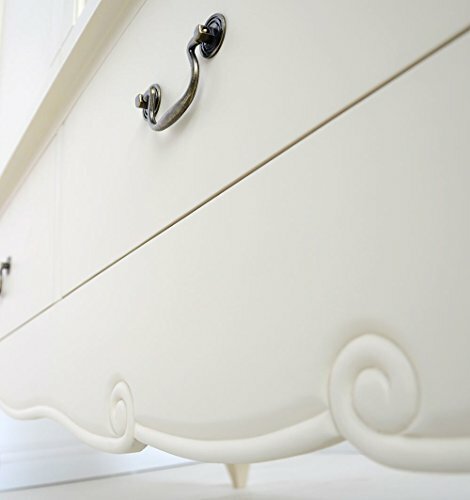 The wardrobe is largely made of solid pine, with MDF drawer fronts, making it a sturdy piece of furniture and yet the hand-carved, detailed legs and serpentine drawer fronts give the Juliette Triple Wardrobe an elegant appearance. The Juliette Shabby Chic Champagne Triple Wardrobe features a double door section with an internal hanging rail, a single door section with both a hanging rail and three removable shelves, and three deep drawers at the base of the wardrobe. Sized at 188cm wide x 217 cm high x 60cm deep (74 inches x 85.4 inches x 23.6 inches), the wardrobe is large enough to store a sizable collection of clothing and accessories without taking over the entire room. The hand-painted Juliette Shabby Chic Champagne Triple Wardrobe using the Juliette shabby chic champagne water-based paints, the wardrobe itself appears to be more on the chic side than the shabby, with a minimal distressed look to it. 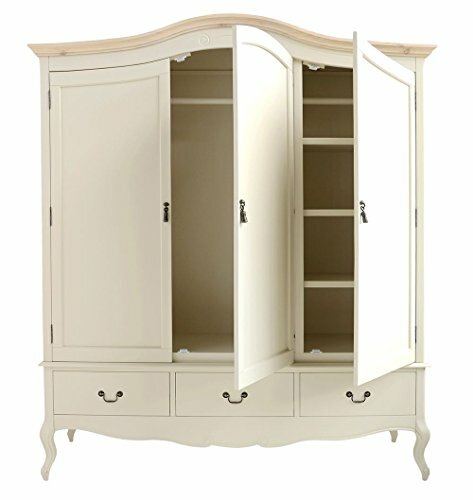 While the Juliette shabby chic champagne is the most popular of colourings for this shabby chic wardrobe, the same design is also available in cream. However, whether you opt for Champagne or Cream the neutral colouring of this gorgeous wardrobe will make it easy to integrate into any room. Pair the Juliette shabby chic wardrobe with the matching bed, bedside table and chest of drawers from the Juliette Champagne bedroom furniture collection to create a timeless and cohesive aesthetic within your home. Double door phase – placing rail, Unmarried door phase – placing rail and 3 detachable cabinets Please observe: This shocking double Cloth wardrobe is introduced partly assembled to verify simple get entry to to the room. Meeting is incorporated, please permit us 1 hour for Meeting.